When choosing theatre drapes, we know that functionality and appearance are likely to be at the top of your list of priorities. At Corona Contracts, we work closely with our clients to provide services tailored to their exact specifications, helping them to achieve the desired look and feel of the production they are being used in. We design, manufacture and install all of our theatre drapes in house, allowing us to control every stage of the process ourselves. This has made us the go-to choice for many people involved in stage production because we work closely with customers to deliver exactly what they’re looking for. We have been lucky enough to work in some stunning theatres and other types of venues in the past. We stock a huge range of fabrics and finishing options to ensure that our clients are able to find what they need and we can design for a huge range of widths and drop lengths. Even if you have particularly demanding design requirements, we are able to deliver. From traditional velvet style finishes, through to more modern bright and patterned fabrics, we have many different options to choose from. Our bespoke theatre drapes offer unbeatable value, since the top quality workmanship applied to them will ensure years of use. In the unlikely case of any issues with our products our clients can rest assured we aim to provide industry leading aftercare services. Not only are all our theatre drapes are designed to the exact specifications of our customers, but we also deliver a professional fit and finish every time. We have experience working in a variety of different environments and our employees will follow all the required safety protocols and keep disruption to a minimum when they are working. 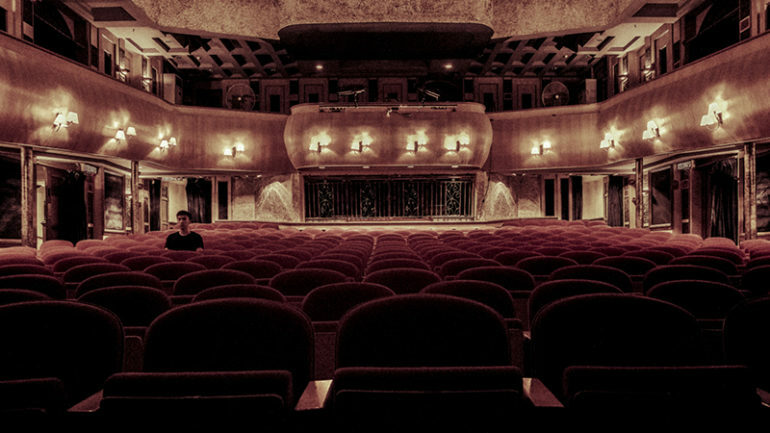 Theatre drapes from Corona Contracts can be manufactured to reduce sonic reflections in large spaces. Often called acoustic curtains, they can provide a certain amount of sound absorption, therefore contributing not only to the aesthetic aspects of a performance, but also impacting the sound production. They are suited to a wide variety of applications in the arts and, unlike fixed sound absorbers, drapes can provide variable acoustics that will satisfy the requirements of differing music or performance genres sharing the same venue. We offer many different options when it comes to upgrading your choice of theatre drapes, one of the most popular is our remote control curtain track system, which provides a smooth, near silent operation, allowing you to maintain the right atmosphere at the beginning of a performance. We’ve tested all of the available motorised options on the market and believe that Italian supplier Mottura are the best in the industry. Up to almost any design challenge, they can support curtains weighing up to 150 kg and an overall track length of 30m can be achieved. Motorised curtain tracks have many advantages when it comes to ease of use and these systems can also be used manually if required. All tracks can be curved to suit specific circumstances and installations and our design team will work closely with you to get exactly what you are looking for. If you’d like to learn more about our services or talk about an installation please don’t hesitate to reach out to the team at Corona Contacts today.